Note the grass clipping mulch on the ends of the rows. When I asked whether or not she used mulch, she said no. “What’s that?” she asked, and I began a little talk about bare soil and why it shouldn't be allowed. Soil is our greatest resource, and as gardeners and farmers we should not squander it. Like water, soil should be protected and used wisely. Mulch is an easy way to do that. Mulching a growing space large or small has a number of advantages. Mulch suppresses weeds. A thick layer of organic mulch will smother any weeds or weed seeds loitering in the soil. Growers particularly worried about weeds can put down a thick layer of newspaper or cardboard first, and then pile the mulch on top. Weeds that do appear will be easy to spot and pull out with relative ease. Once pulled, the offending plant can be laid on top of the organic mulch to decompose and add its nutrients back into the soil it came from. Mulch regulates soil temperature. A good thick layer of mulch keeps soils cool on hot days and helps retain warmth as temperatures drop. Soil that is too hot can desiccate seeds, as well as overheat and subsequently stress plants. Winter gardeners will experience less frost heave that can damage plants, too. Mulch helps retain moisture. A well-mulched growing space requires less watering, especially once plants are established. Unprotected soil gets baked hard, which makes it difficult for plant roots to grow in, much less to find the water and nutrients they need. It also makes it difficult for water and nutrients to move along, carried as they are by the various microscopic community members that live in the soil. Soft, crumbly soil makes all of that possible. Mulch protects soil from wind and water erosion. Soil, as I mentioned earlier, is our greatest resource. Protecting it is a gardener and farmers first duty. Unmulched soil is more likely to blow away on the wind or wash away in the rain. Soil that is not in your garden bed doesn’t do much good for the plants. If it lands in waterways or gets vacuumed up from the neighbor’s living room rug, it’s wasted opportunity. Rebuilding soil is hard work and takes time. Protecting it with a layer of mulch means building on what is already there and making the most of what you have. Mulch can be either organic (grass clippings, leaves, sawdust, old weeds not gone to seed, hay or straw) or inorganic (black plastic, rocks, or landscape cloth). Organic mulches can also take the form of living mulches: low-growing plants like alyssum, purslane, clovers, or corn mache. These can be edible or help attract pollinators and predators that will help with gardening above ground. (See this review of The Holistic Orchard by Michael Phillips for some brilliant ideas.) It serves to suppress weeds, regulate soil temperature, and protect soil. However, as convenient as inorganic mulches might be, organic mulches are the logical choice. Organic mulches are a soil builder. Layered on top of the soil, organic mulch makes a nice home for worms and all the other creatures that keep soil healthy, bring nutrients to the root ends, and protect plants from disease and predators. (If you don’t believe me, take a look at Teaming with Microbes, and you’ll never look at your soil the same again. Read a review here.) At the end of the season, organic mulch can be tilled in or, better yet, simply layered in for the next season. In this manner, the mulch provides the organic buffet those little soil-building creatures desire. As they go about their little daily lives eating, pooping, and chasing each other, they leave behind a trail of nutrients that eventually put the tomato on the table. It is only fair to say that a case can be made for inorganic mulches. 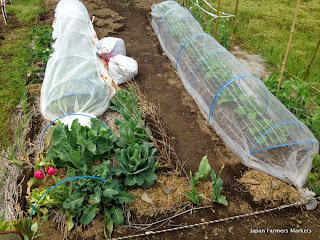 Black plastic is a miracle tool for warming the soil in early spring or when growing winter vegetables. 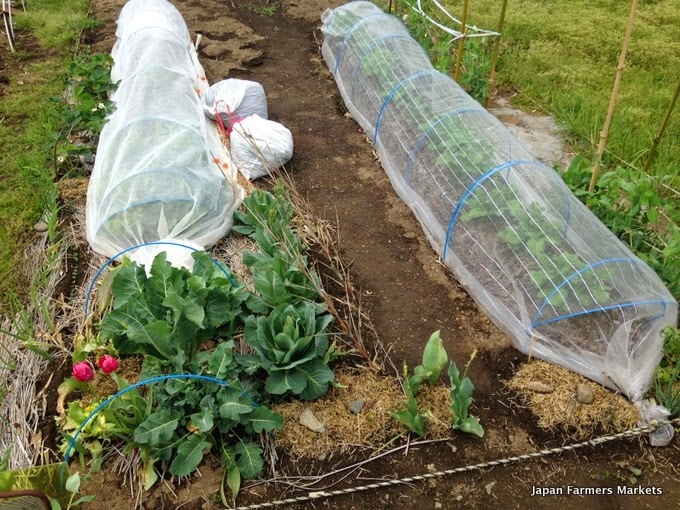 Landscape cloth lets water through and effectively suppresses weeds. The problem with these items, though, is that they are expensive, petroleum-based products that are difficult to dispose of at the end of the season. This increases the carbon footprint of a growing space. Even if that doesn’t much matter, the toxic gases released when they are burned should. And if that isn’t an issue, then I’ll refer back to the previous paragraph that starts “Organic mulches are a soil builder.” I’d also add that they are often free. The Resilient Gardener by Carol Deppe also has some excellent thoughts on mulching in various climates and on various types of mulches to try. Frankly, I recommend anything by her that you can find. Lasagna Gardening by Patricia Lanza is a fantastic method for building a gardening with great soil in relatively short order. Teaming with Microbes: The Organic Gardener’s Guide to the Soil Food Web by Jeff Lowenfels and Wayne Lewis will rock your world with what it reveals about the soil beneath your feet, flowers, and vegetables. The Holistic Orchard by Michael Phillips is not just for orchardists or those with fruit trees. Phillips offers a number of excellent ideas that can be applied beyond the apple tree.